Like any water treatment unit, water softeners sometimes malfunction too. In some cases, these malfunctions happen out of the blue because of improper maintenance or prolonged use. 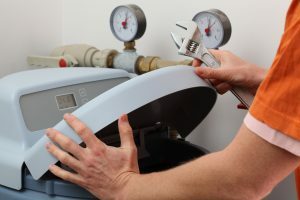 In these cases, there are some things you can do to solve the problem and have your water softener up and running again. There are several reasons why your water softener may be functioning poorly. In this article, we’re going to focus on salt clogs and high water levels in the brine tank, and how to troubleshoot these problems. Water filtration vs water softening – what’s the difference? While both systems are used for water treatment, one system targets chemicals and other contaminants in tap water, while the other system softens water to prevent lime-scale deposits and other problems caused by hard water. Therefore, water filters and water softeners are two different systems designed to address different issues with water. Some people may install a water filter hoping that it will also treat water hardness issues, while those who have installed a water softener may mistakenly believe that they don’t need a water filter as well, while in fact a water softener only addresses water hardness issues. 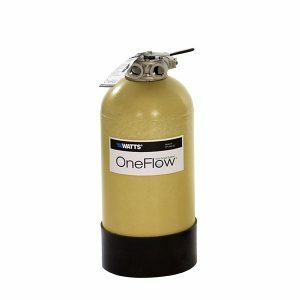 So when do you need a water softener instead of a water filter? Understanding the differences between these systems can help you make informed decisions on what home water treatment systems to purchase. The problems caused by hard water, i.e. 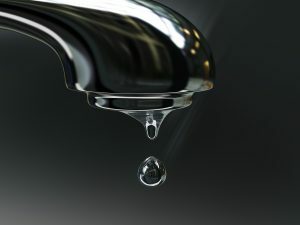 water that is high in calcium and magnesium, are difficult to miss – scale build-up in water appliances and water heaters, spots on sanitary and glassware, clogging, thin milky film on tea and coffee, dry skin and hair, yellowish stains on clothes, and reduced energy efficiency in all water appliances coupled with costly breakdowns and replacements. Water softeners are designed to transform the calcium and magnesium minerals that are responsible for wreaking havoc in your bathroom and kitchen appliances, and turn these minerals into sodium ions through a process called ion exchange. Because water softeners work by directly targeting hardness minerals, they present many benefits to those living in areas with water hardness issues. The focus of municipal water suppliers is on disease-prevention, thus, if your tap water’s hardness level is causing you any of the above problems, you can benefit greatly from installing a water softener system in your home. Do non-salt water softeners really work? 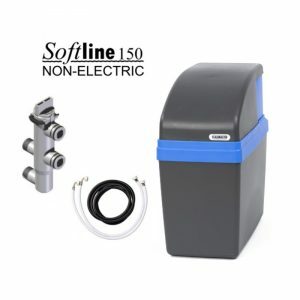 Non-salt softeners or salt-free water softeners are a subset of water treatment applications that are focused on treating hard water problems and preventing lime-scale from attaching to surfaces and causing disruptions and damages to home appliances that use water. While traditional water softeners are salt-based, meaning they are equipped with brine tanks that are needed to flush the resin beads encumbered with turning hard water ions into sodium ions. This is how most water softeners work. Non-salt water softeners are advertised as a low-maintenance, no waste alternative to salt-based water softeners, but do they really work? And if so, how do they operate and how do they produce soft water? Since lime-scale deposits caused by hard water problems affect the majority of households in the United Kingdom, several different methods have been devised to prevent and inhibit the formation of lime-scale. Water softeners are the most widespread scale control method that operate by turning hard water into soft water. Lime-scale water filters prevent the formation of scale by altering its structure, while magnetic lime-scale inhibitors prevent the attachment of lime-scale crystals to heat exchange surfaces. 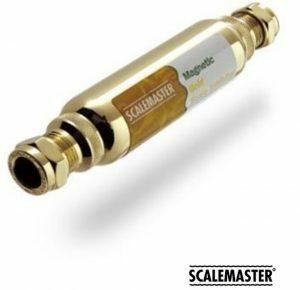 The Scalemaster Magnetic Gold works on the same principle, and it’s designed for use in individual appliances as opposed to whole house water treatment applications. This review will highlight the advantages of using a limes-scale inhibiting device like the Scalemaster and how the magnetic field it generates is able to alter the structure of scale crystals and render them unable to attach to surfaces.